On June 30th, 1908 at 7:17am, a massive explosion took place in the atmosphere five miles above Siberia. 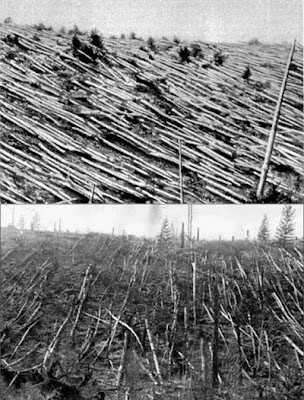 This explosion left the forest underneath burnt and charred, and pushed trees over in a 20-mile radius. It threw people to the floor and broke window panes 50 miles away. It was the absence of physical remains that left the Russians perplexed. They felt that only a massive rock from outer space could have caused those effects. The effects were consistent with a nuclear bomb; However, no nuclear weapons existed in 1908, for that reason, some people speculated that the blast was caused by an alien space craft crashing to Earth and others proposed the theory of antimatter or a black hole imploding above Siberia. Entity that came to dialogue: Master Ruanel. Ruanel: It was a meteor. Interlocutor: Wasn’t it a UFO that crashed? Ruanel: No, I confirm to you that it was a meteor. This entry was posted at Monday, January 11, 2010 and is filed under Mysteries and Enigmas . You can follow any responses to this entry through the .